We’re happy to announce the launch of Projects for all LaunchDarkly customers. Projects allow you to manage multiple software projects under one LaunchDarkly account. For example, you can create one project called Mobile App and another project called Web App. Each project will have its own unique set of environments and feature flags. By default, all team members in your LaunchDarkly account will have access to every project within that account. Please see our documentation for more information. Create multiple development environments within each project (e.g. local, QA, staging, and production). When you first create your LaunchDarkly account, you will start with a Default project. You can then create additional projects for each of your software applications. 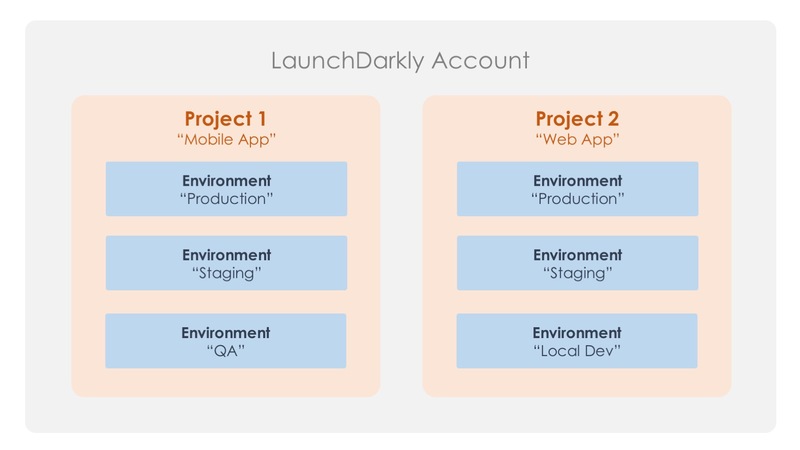 A LaunchDarkly account showing two projects “Mobile App” and “Web App”, each with its own “Production” and “Test” environments. Creating a new project is easy. Name a project and you’re ready to go. Within your projects, you can create multiple environments. Environments allow you to manage your feature flags throughout your entire development lifecycle — from local development to QA, staging, and production. These environments are scoped to the project. Please note that all projects must have at least one environment. Easily create multiple development environments for each project. In this example, we are adding a “Local Development” environment to our “Mobile App” project.